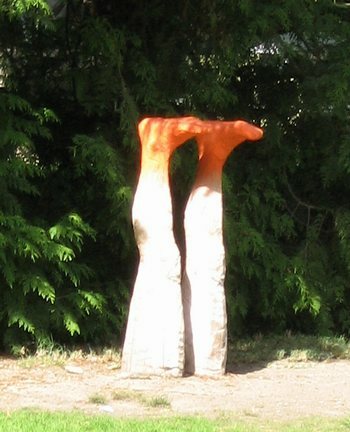 More weird public art in the Luxembourg Gardens, the neighborhood we will be moving to on Monday. One of the scientists I admire the most, Louis Pasteur, has an entire window of a store-front medical laboratory devoted to his accomplishments. This is on rue de Vaugirard. I am so mad at Nicolas Sarkozy now. You probably already heard about the sad case of Jeff, because it made the New York Times. In case you have not, Jeff is a lad who is 19 years old, just recently graduated from high school here in Paris. He is of Nigerian origin, and is here without proper papers. He has no father, and his mother in Nigeria was assassinated. He has no family whatsoever in Nigeria. Yet Nicolas Sarkozy, as minister of the interior, wants to have him and many, many other young people deported. While I agree that it is important to enforce immigration laws, one must be humane in doing so, and the “case by case” approach Sarkozy is using should take into account young people like Jeff. Jeff was a good student, and he wants to continue his studies here in France. He has a French girlfriend, and many other friends as well as former teachers who admire and support him. He is described by everyone who knows him as a very nice guy. He would no doubt be a positive addition to French society, not a detriment at all. And now Sarkozy has told the mayor of Cachan that the problem of the squatters in his town’s gymnasium is his problem, not France’s. This is getting to be ridiculous! Does Sarko realize how heartless he sounds? These people need to have a place to live. At any rate, he is almost assuredly the conservative party’s Presidential candidate in next Spring’s elections. His main opponent may well be a woman, Ségolène Royal, from the socialist party. Ségolène is the only candidate, according to the opinion polls so far, who could possibly beat Sarkozy. Ségo and Sarko are both very popular. Yet, inexplicably, the socialists are all fighting amongst each other because there are about five other socialists (all men) who want to be the candidate, never mind that the polls show that they would not win. The socialist party needs to get its act together. Royal refused to debate with the militant young socialists at the socialist party’s summer convention (an event that is not really like one of our big national party conventions, but more like a party convention in a big state like Florida, California, or New York). That seems like a political error, but I am sure she had her reasons. I’d like to know what the real reasons were. I’m still reading Sarko’s book, even though I’m fed up with him, because I’m learning some useful idiomatic French from it. Since it is in first person narrative form, the book is useful for this purpose. And it is also very current. We finally made it back to L’Épopée on avenue Émile Zola. Even though they have not seen us since August 2005, monsieur and madame remembered us instantly, greeted us warmly, remembered what we each like to drink, and remembered some of our favorite little jokes. The food was the best yet that we have had in this fine (and slightly expensive) restaurant. There was a new vegetable terrine served with the main courses. I asked our server, who is monsieur and madame’s daughter, what was in it. She didn’t know exactly, so she went to ask “maman.” Mother didn’t know either, and so the daughter went downstairs to ask the chef! I think this must be a new chef with new ideas of his own. By the way, the terrine was made with cèpes (large brown flavorful mushrooms), artichokes, and cabbage. It was lovely. We’ve been on very long walks now that the rain is gone. Yesterday, we walked all the way across Paris again, mostly along the Seine, to the Jardin des Plantes and the Gare d’Austerlitz. Today, with more absolutely gorgeous weather, we walked up the Allée des Cygnes and then over into the Passy neighborhood, in the chic 16th arrondissement, then back via the Passerelle de Billy and all the way over to the flower market on rue Linois (where we bought a lovely bouquet to leave for the apartment owners who return Sunday) and back home again.